Strojírna Litvínov as one of the Czech leaders – STROJÍRNA LITVÍNOV s.r.o. 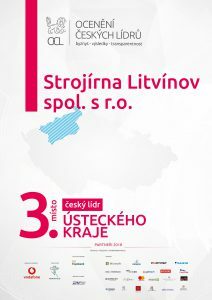 Strojírna Litvínov has been awarded in prestige competition called “OCENĚNÍ ČESKÝCH LÍDRŮ” (Appreciation of Czech leaders) in Ústecký region. Celebration night were taken in a beautiful place Sacre Coeur on 12th June 2018. Companies has been chosen based on their economical results. 85 finalists come up from 1327 companies, which fulfilled criteria of the competition. They were chosen by special guarantors, company CRIF Czech Credit Bureau. “Our goal is to create the platform, where all leaders can meet, change their experiences and inspire. Our effort is to react on actual questions which are daily solving in companies,” says Helena Kohoutová, founder of project, known as “Appreciation of Czech leaders”. To this project can be company nominated after analysis publicly available data of all companies in Czech Republic processed by special guarantor which is international company, the specialist on rating and scoring of companies, CRIF-Czech Credit Bureau, a.s. 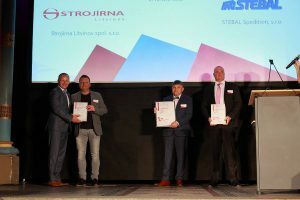 The professional selection of finalist was done according level of their economy by Index Cribis which is based on financial statements and also on important non-financial statements. The jury is also using the information as business story or activities which company does for public. “We do really care about professional choosing of finalists and this is the reason why we firstly do evaluation of their economy by Index Cribis which is based on financial statements and also on important non-financial statements and then the jury do an evaluation bases on story of their business activities and how much companies do for close public” says Pavel Finger, deputy chairman of company CRIF- Czech Credit Bureau.